Have you ever felt like you’ve been holding your breath for days? Have those gazillion things you hoped to do ever been piled in a heap on your chest? Has one itty bitty thought about the achievements you’re aiming to accomplish ricocheted you across the room into a desperate mood? Have you ever imagined that you might be knocked out of the whole kit and caboodle by a truckload of failure charging towards you? Have you ever been overwhelmed from trying to do every little bit of everything to perfection? Well then, you’re not alone. After I finished better than I had expected in a recent 50-mile race (a race that I had only aimed to finish), I decided to go all-in and race my upcoming races. My next one is Magraid, a 100k three-day stage race in Magredi National Park at the foothills of the Dolomite Mountains in Italy. Thanks to Trail Running Ireland I’ll be a press participant at the event. I’ll be sharing my experience with their audience and I’ll also be competing. I’m now in full swing preparing for this race in June. I’m cross training, speed training and hill training. I’m going for it and I’m feeling strong and confident. I’m freaking out and I’m questioning myself. My training is full-on and like most of us, my life is full-on. I’m not a professional athlete so running is slotted in around the rest of my life, which is damn busy. My husband Fred and I have three kids, ages 9, 2, and 1. We don’t have a house cleaner or a chauffeur. We do have a local community day care that the littles attend two mornings a week (thank heavens). Fred and I are a good team and we work things out together. But sometimes a clamp tightens around my chest and it all gets too much. I aim to do every little bit of everything to perfection and that isn’t always possible. There are times I succeed and times I fail. I get frustrated when I don’t achieve goals within my set schedule. I have meltdowns. I want to give up. But I don’t. Henry gets to school on time. Sadie is potty trained. My running is improving and opportunities are emerging. I’ve managed to dodge that truckload of failure. Here’s how I’ve done it so far. 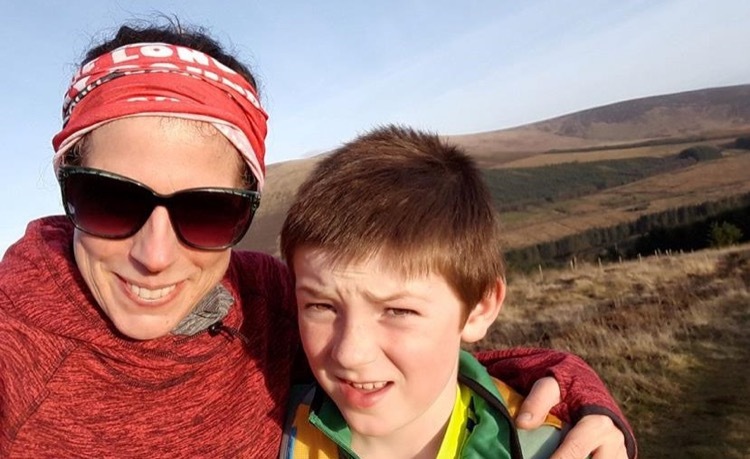 Alicia and her son Henry after running Keadeen Mountain, County Wicklow, Ireland. Photo courtesy Alicia Christofi-Walshe. I come from a very long line of chatty people. My mom was a chatterbox, as was her mom and hers. Talking with trusted people helps me to sort out the mumbo jumbo that’s bouncing around in my brain. When worries are spoken aloud and shared with others, they don’t seem so catastrophic. Whether the chat is about how I’m going to fit in a hill session on a busy Saturday or how I’m going to sort out an issue with one of the kids. Talking enables me to put the puzzle pieces together and to exhale as I look at the finished picture. We’re the conductor who drives the freight train that is our body. We work hard at what we do and food is the fuel for our journey. This fuel keeps our minds and bodies strong. Strength keeps the self-doubt at bay. When I feel myself getting hungry, I eat. I don’t diet. I fuel my body so it can continue to gain strength and recover from the training. I eat healthfully but do not obsess about calories and fat. If I want a bit of chocolate or a piece of cake I eat it. Life can be bloody difficult enough without having to go through it hungry. Love helps! Yup, as cheesy as it may sound it’s true. Like a lot of us, I can easily get caught in a whirlwind of obsessive self-focus on my goals. Loving my family takes the focus away from me and brings it back to the wider world. Breathing in the love that swirls through the air during family moments, I refill my lungs and my feet come back to Earth. Family life puts my running goals into perspective. My kids and my husband think it’s cool that I run, but if I decided tomorrow to never run again they wouldn’t give a monkey’s arse. Running is not the most precious thing in this life, love is and that’s exactly why it helps. At the finish of Raw Ultras. 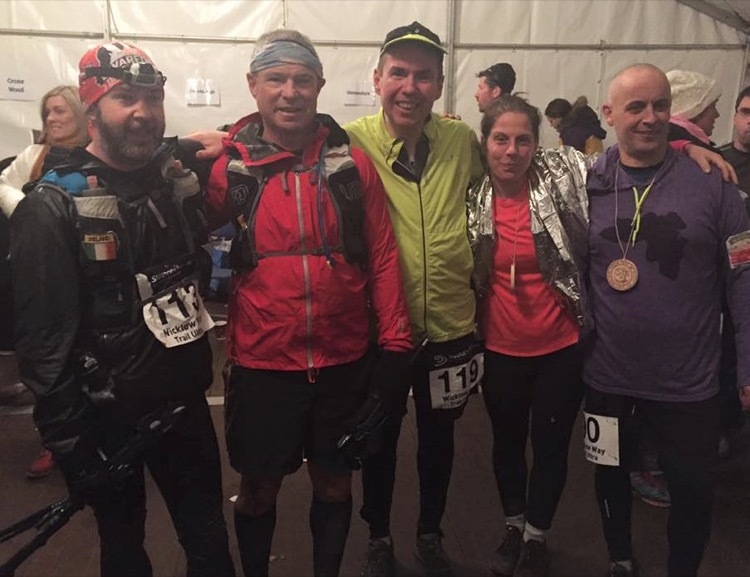 50-mile runners, left to right: Paul Daly, Mark Keogh, Ray Cummins, Alicia Christofi-Walshe, and John Dolan. Photo courtesy Alicia Christofi-Walshe. No, not champagne at finish lines (well actually, yes sometimes)! But generally, I skip the bubbles and give myself a pat on the back when I achieve goals. We should all be proud of our achievements and we should focus on them. I stick my runs up on Strava and I get a few kudos. The most rewarding kudos are the ones I give to myself – when I give myself permission to be proud of my achievements. At the end of a run we should certainly give ourselves an inward smile or high-five our running friends. We need to celebrate achievements and focus on the positive. Positive is good. Positive keeps the clamp from the chest. We’re all trying our best in life. We set personal goals, we work, we have careers and we care for others. Day to day we may get flustered. For some it’s a subtle shift of mood and for others it’s a more intense anxiety. Either way, we can try to soothe ourselves by having a chat, a meal or a private moment of celebration. We must remember that it’s ok if we don’t reach perfection in every little bit of everything. What matters is that we persevere and continue moving forward on our chosen path. Next time you achieve a goal, try this: Let one arm drop down outstretched by your side and then extend it forward towards the centre of your body. Stretch it up over your head and bend your elbow until the palm of your hand rests on our back. Pat continuously until a smile appears on your face. You did it. Alicia Christofi-Walshe is a mother of three living in County Wicklow, Ireland. Originally from Boston, she worked as a professional dance artist and choreographer in the States and Europe for over a decade. 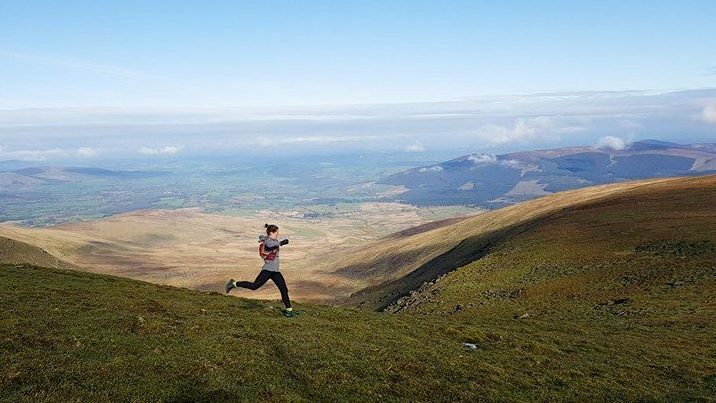 Alicia’s been running marathons since 2009 and ran her first ultra at Irish Mountain Running Association’s Glen of Aherlow Loop de Loop in September 2016. 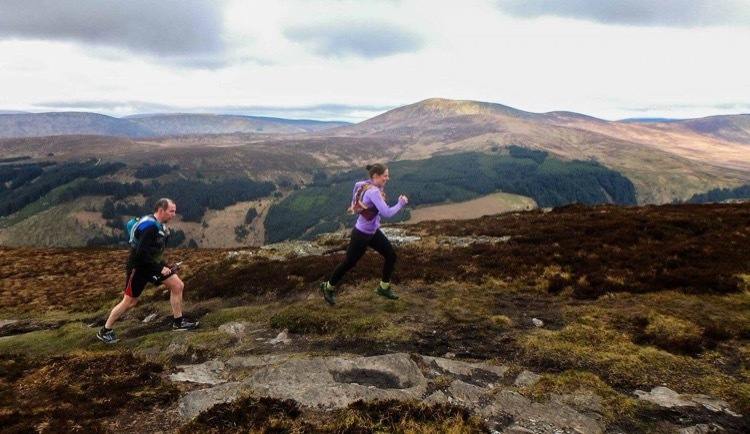 She is a regular contributor to Trail Running Ireland and was recently accepted to Outdoor Women’s Alliance Editorial Mentorship Programme. Follow Alicia’s running adventures on her blog and on Instagram and Facebook @Run Mammy. Brilliant read and I’m loving the pat on your back. Well said Alicia.